It's Super Mario Maker day, and it's no doubt going to pop up in a lot of articles; actually, we make no apology for that. It's earned a rare 10 in our review, and is a reminder of many of the qualities that have made Mario an iconic part of Nintendo and gaming history. It's a big deal. We are running a competition in the UK related to the EGX expo, but this page is nevertheless for EVERYONE, with only specifically tagged entries being part of that contest. Be in no doubt, this tool is for the whole community around the world. As you can see on the page, searches can be broken down into six categories, and when you share a level you input its code, name and a brief description. To try levels all you need to do is search for it in the game - the level ID is the most fool-proof option - play it and then share a rating, comment and 'Like' as you see fit. This is a great chance to share in the experience, talk about level design and be helpful to each other with tips and feedback. Better yet, we're in the process of liaising with some developers to ask them to contribute, and will be running regular video and feature articles highlighting our staff favourites, listing those the community are enjoying the most and more. So, get cracking! We'll be picking some favourites next week for our first related video and features, and we can't wait to see what you all come up with. So glad I bought Splatoon Day 1 and enjoyed all that game had to offer, including the camaraderie w/ people on this site, b/c I'm really not that into 2D Mario platformers. But I will keep an eye out for levels from people I know and give them a try. Really wishing I was getting Mario Maker today, and this level sharing community sounds awesome. But alas, the game shall be an eventual buy for me. Splatoon needs to stop coming out with content so I can properly play Mario Maker! This is great,cheers for this! 10/10 Indeed look at what you can do with this game unlimited potential for levels AMAZING! Oh, I have been working since yesterday on a doozy of a level, would be fun to watch Alex try it out. Will add it later on when it's done. Very cool NL !! I hope this is a long lasting feature. I won't be able to dive into the game until the middle of next week. @rjejr Is this the official end of "the Summer of Splatoon"? Kinda sad actually. Anyone else have Mario Maker yet? I'm looking to stop by at Target and pick up my own copy. Looks like a ton of fun! Im missing 8 example levels (World 1 and 2) on the "Save Bot" (If its called like that in english) Any hints ? @shigulicious It will be in my house. Though I haven't played in over a week, went on vacation and now I'm watching the NY Mets make a playoff run. And after a week I'm kind of afraid to get back on. if this game sells well, which it will, it just goes to show how stupid and incompetent third parties are. They could have created similar experiences using the Game Pad. The picture of Blue Toad holding the gamepad is adorable. Splatoon was a lot of fun, but I'm ready for 2015's best Nintendo game. Will you guys do more in the future? Just waiting on my game in the mail. Out for delivery according to tracking, so it will be today at some point. @JaxonH Not my department unfortunately, but I know our web boss Anthony sees the demand for it but, sorry, I have no idea! Aweome initiative, nintendolife! My local retailer won't get the game until the 17th, but after that I'll definitely get crackin'. Can't wait to start making levels! @JaxonH Mine arrived about an hour ago via UPS from Amazon. In a yellow bubblewrap lined envelope, upper left corner was kind of crushed, but I thought it even weirder that it wasn't shrink wrapped. The game inside the outer box was, but not the outer box containing the book. Book was ok, hopefully the XCX book is better. It's now in a gift labeled Happy Birthday, and my sons birthday isn't until next Thursday, but I'm giving it to him after dinner anyway, 2 years ago I gave him Pokemon X for his birthday and I think he had to wait about a month to play it when it released in Oct, I just wrapped the $5 pre-order GC from Target. So between him and his brother I'll never be on my Wii U again before 10:30PM. This might be the last Mario game I buy, unless Galaxy 3 comes out and another spectacular 3D Mario hits the shelves. The franchise has gotten a bit repetitive, but thankfully Super Mario Maker aims to solve this problem...for now. Nintendo, please do something new with Mario. No, I don't mean make another New Super Mario Bros. game. Please, don't even think about it. @JaxonH Did you take the day off to wait for the truck? w/ all your amiibo shopping Nintendo should make sure you get an uncrushed box. But I ordered from BestBuy. Then I was worried it wouldn't come today cause it hadn't shipped out yet on Wednesday, so I decided to buy a 2nd copy in store. But then I figured if Ima do that, may as well drive to BestBuy to get it since it's 20% off AND could snag Splatoon for $31.99 with it (deal they're offering). But THEN I decided it's a 30 min drive to BestBuy, probably $10 gas there and back, so why not just order online and pay the $7.50 for express release day shipping. Saves me a trip AND costs less than the gas I'd spend. So here I am, waiting on my copy (said it should arrive between 1-5pm, and it's already 2pm). Turns out my other copy is arriving today too though. After work I go pick up my preorder. Can't wait. @rjejr If I recall correctly, Kirby's Dream Collection: Special Edition's outer box wasn't wrapped. I agree that it's completely annoying and would be better to prevent any damage, especially of you're a collector. @JaxonH If you keep a journal you can copy and paste that in under - What I did today. And I have calculated gas into my decisions before, like when I drove about 15 miles a couple of weeks ago to pick up Mario and Sonic b/c it wan't available for shipping. We haven't played it much, but for $18 for a Wiimote Plus I couldn't not drive and get it. Hydunai Elantra, 35MPG, I bought one to buy video games. I have feedback: Could you please make it not possible to rate and like your own levels? It will be abused for sure. Thanks a lot for making this! Going to enjoy browsing / posting levels there. Just to echo what others have said, I can barely squeeze in any other games because I'm still so hooked on Splatoon. I had a minor issue with my MM pre-order, but Nintendo UK customer service were amazing and my delivery is back on, but will be a fee days yet. I didn't expect to be this excited about this game - I even want that bundle, the box alone is easily the most iconic of all of them. @ThomasBW84 idk if I missed it somehow, but is there a way to search for levels via tags? @GLA Did they say what the problem was? They haven't dispatched mine and I ordered months ago! Just got my copy from Amazon and look forward to playing it after I finish work. Thanks for setting this up! @JaxonH There already is a notification system! I get an email everytime someone mentions me in the comment section and also when someone posts in a forum thread that I'm following. @ThomasBW84: A Pm system would indeed be nice. But I just wanted to congratulate you guys on having the idea with the Mario Maker NL community. I just created one short level so far, but I will be entering mine here some for sure. @pherret022: Haha I totally get that! I'll be playing Mario Maker alot for sure, but I think I'll still play Splatoon more often. @Ralizah: Splatoon is definitely my personal game of the year. I don't think Mario Maker can change that, but we'll see. Ugh too much to do today! I am definitely down for trying other's Mario Maker levels. I've got a few ideas of my own, tho it didn't seem I was getting 15 minute unlocks earlier, do I have to keep playing? I got 9 levels uploaded but even though the hardest wasn't that bad(I thought anyway) the clear percentages are kinda low. Maybe I will share some here to see if was just the people playing them. @SetupDisk I've noticed that the clear percentages are shocking low across the board. Take long and/or difficult levels out of the equation and it still seems to be the case! I haven't managed to finish my first course as I keep getting sidetracked playing others'. There is a plethora of decent user content already, gotta say: I'm impressed. The rating system is doing its job thus far. Look up Winged Goomba World and Super Underground Adventure! I plan to make more original levels, but this was first on my to-do list. Uploaded my first level, but it seems it's just getting skipped over. I was afraid that might happen. I tried to make a real course but it gets drowned out by all the others, the "find this" or "do that" stages. I have 4 levels. I haven't unlocked everything. Please try them if you have time. I really appreciate it. Whether you love it or hate it. 1 is easy, 1 is normal, and 2 are hard to very hard. I made the first 3 with the point of maintaining the amiibo costume so that it gives a different feeling to the level. 4 levels...i forgot two of the codes...search my nintendo name, "Corey" or "Parrydox"
THANKS ALL! Post a comment on Mario Maker and i'll play your levels and comment. Just made my first level with the barebones toolset. "The Longest Walk-Skip-Jump" is the title. I just wish I had more stuff at the moment. Bought the game this morning (physical copy) and we've been playing it all day, only working on a few levels, but playing many different creations. Very curious to see how successful this is in terms of sales, because I think they hit a home run. The best is always yet to come. I'm working on a little level I'm calling Pyro Tunnel. I'll upload it soon! I'm going for challenging difficulty without going overboard. Is anyone else playing Super Mario Maker? Samus, Squidboy, & Pacman Delight! @ThomasBW84 Well I would be making levels, but my preorder from the UK Nintendo Store still hasn't arrived. My delivery estimate is Monday. Very bad form from the Nintendo Store, reminds me what happened with Mario Kart 8. Depending on how wide spread this late delivery is, it might be even be news worthy, though obviously it pales in comparison to GAME's blunder. Did anyone else here order from the Nintendo Store, and are still left waiting? I said I would wait but I couldn't resist. Just bought this today guys. I'm so psyched for tonight! It's all about beer and making some terrible super Mario levels!! @Einharjar - I may be wrong but I think the first couple of rows are unlocked through Create? Will be adding my first couple shortly, just as soon as I've stopped playing!! 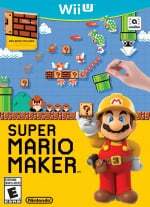 So when are we getting Super Mario 3D Maker so I can remake Galaxy levels in HD? I buy a lot of Nintendo games - I buy too much actually. But I have no interest in Mario Maker. No Slopes? Cool. I'm not buying it. Been playing this for most of the day. Wow, deserves that 10 out of 10 score. Nintendo is going to have to do something pretty radical to top this for their next 2D Mario game. This would be great on 3DS as well. Finders crossed they do it. And then the video series can get taken down by Nintendo because Nintendo is the worst. I can't believe Nintendo had the gall to rip off LittleBigPlanet, a game about creating and SHARING, but is doing everything in their power to stifle the sharing bit (thus completely missing the entire point of what they ripped off). Anyone want a Wii U and a 3DS? Because I don't anymore. Is there any way to see in your upload course where people have died/ are dying? I can see some flashing red x's in the overview screen but i can't work out how to view that in more detail? Am i overlooking something completely obvious? Here's the ID for Pyro Tunnel if anyone wants to try it! It's a pretty tough level, although I had to remove a few enemies that I thought made the course too hard. I saw you had played them. The second one was a tad more difficult, because it involved a couple wall jumps over a pit. I'm trying to keep the courses reasonably challenging, but totally doable (not like all those insane courses that test even the hardest Mario veterans). I think if a person can't finish the level in a couple tries they're probably not gonna like it. I should have introduced the wall jump mechanic over a safety net earlier in the stage to prepare you for the end. Ah well, live and learn I suppose. Hope to do much better with a full tool set. These were done relatively quickly actually. Cool idea! I have posted 2 levels so far: "Trampoline madness" and "piranha field". Hope you like them! Struggling for feedback on my level =( 7 attempts and no finish. I was convinced it was around mid-level difficulty but I'm now wondering if it's too hard. I'm surprised at the general quality of levels to date. I expected to have to really search for decent levels but frankly 1 in 2 are playable with maybe 1 in 4 being really good. Trying to do my part on NL rating some community levels and again: lots for quality. @Einherjar Did you ever get anything to show up in those top 8 (4x2) boxes? I only played for 2 hours and beat 10 man challenge twice but I know which ones you are talking about. @rjejr Jup, figured it out. Those 8 Stages are the example levels for the edit packs you unlock. Each major pack has a level showcasing the new features and themes. @Einherjar Ah, thanks. Glad your head didn't have to explode. I think I've only unlocked the first pack myself, I'm grazing more than working. I think youll start to get these example stages as soon as you unlocked the second row of tools. Is there a link at the top of the website to find this easily? I had to hunt through the news articles to find this.